Cats find the strangest places in your home to disguise themselves, and it's natural to wonder why your cat is hiding. It's important to recognize when hiding is a normal expression of a cat's personality and when it's a sign the cat may be scared, anxious or suffering from a medical problem. Know your cat's daily routines, so you can move quickly if you see that something is amiss. A normal reason for a cat hiding is based on their ancestry as hunters. In the wild, it's wise to economize your strength and energy for bursts of speed to catch prey, so a cat will often hide while waiting for something to pounce on. Of course, in the modern home there's no prey (hopefully!) to spring on, but this also explains why your cat will jump out at you at random times. He's expressing a natural urge and probably having fun too. Cats practicing this behavior will often hide in paper bags and cardboard boxes conveniently located in places where they can observe action around them and jump out when necessary. Another byproduct of their ancestors is the nocturnal nature of cats. Some cats tend to hide more during the day and become active at night. This explains why owners often have a hard time getting their cat to go to sleep when they're ready to turn in for the night. Cats are also crepuscular, which means they snooze during the day and are most energetic just after sunrise and before sunset. Your cat may tend more to the nocturnal side than crepuscular or vice versa, but in either case they'll hide more during the daytime hours to sleep. In addition to following nocturnal or crepuscular patterns, cats can hide at specific times of the day for environmental reasons. If something noisy or disruptive regularly happens, you may find your cat hiding ahead of time to avoid it. For example, your cat may be nowhere to be found when the noisy school bus pulls up to pick up the neighborhood children, or when a group of guests enter the home, such as the kids and their friends arriving after school. Cats may do this out of fear and stress, or because they simply just don't like the ruckus. Since cats often are sleeping when they hide, a simple reason is they just want to find a place to nap where they won't be interrupted. Hiding in a comfy, dark closet on some blankets or in the laundry hamper can be a great way to doze off and not worry about being stepped on or bothered by the pesky dog. They also tend to hide in places that are quieter and out of the way for precisely the same reason. 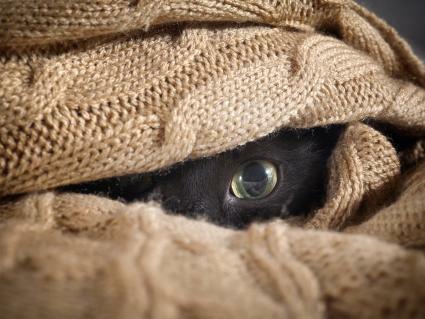 In very warm and cold weather, you may find your cats hiding to regulate their temperature. On hot days you may see them finding dark, cool spaces to avoid the heat. Likewise, on cold winter days they will find cozy warm spots, like under blankets or in the laundry hamper, to help get warm. While much of a cat's hiding behavior shouldn't worry you, there are times when it is a serious problem. If your cat suddenly starts hiding when in the past he has not, this means your cat is either stressed, afraid or ill. Stress can cause a cat to hide because it makes them feel safer, or at least less "on the spot" and threatened by whatever is upsetting them. It's not unusual for cats in a new home to hide for a period while they adjust. 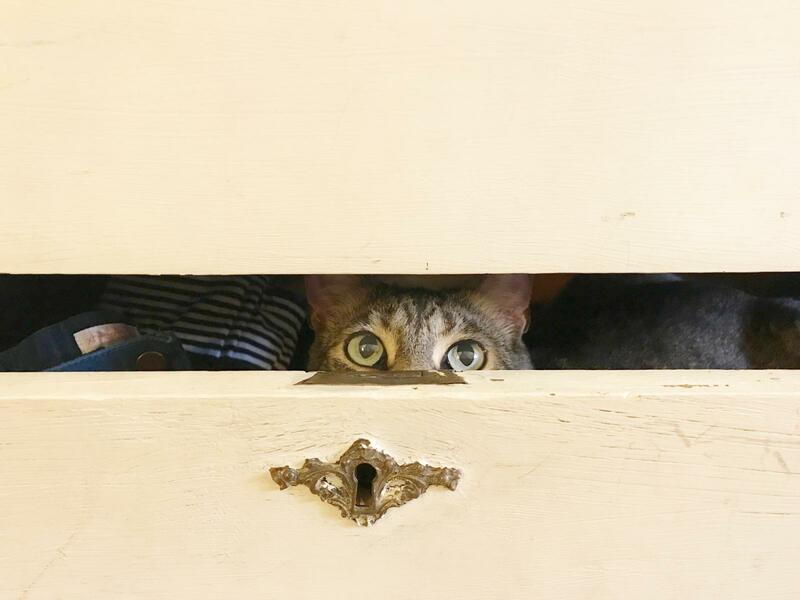 Bringing a new pet into the home can also lead to a short-term period of hiding, as well as new household members like an infant or a roommate. Usually cats acclimate to the changes and resume their normal behavior. The best thing to do in these cases is to let the cat come out on his own terms. You can toss him some treats when you see him, but don't force him to do anything until he is ready. Fear is linked to stress and happens when the cat is truly frightened of something in the home and not just sensitive to changes. A cat can fear new visitors to the home, new pets, or even react to sounds and activity. If there is new construction going on next door, this noise may terrify your cat. Likewise, some cats may become very frightened of outdoor cats in the neighborhood, feral cats that roam around your property, or other animals or people. If your cat seems fearful and displays concerning body language, consult with a qualified behavior professional right away. One of the first signs that a cat may be sick is a sudden spike in hiding behavior. Elderly cats may also hide more as they become more susceptible to age-related illnesses. If your cat begins hiding and you can't determine any environmental changes that caused the behavior, you should take him in for a full medical check-up. Your veterinarian can determine if your cat is hiding to deal with pain and discomfort or if it's a behavioral problem or a combination of the two. Assuming your cat is medically healthy and not overly stressed or afraid, you can try some strategies to encourage them to come out more. If you know where he's hiding, walk past and gently toss a few cat treats just outside his spot. Then walk away and let him get the treats. If you know he's taken the treats, repeat the process while slowly expanding the distance from the hiding place to where you toss the treats. If this process goes well, you can toss the treats and wait for your cat to get them and then use clicker training to mark the "coming out" behavior. Gradually work on clicking and treating your cat for coming out more and more. You can even clicker-train your cat to come when called! You can try using a cat toy to encourage him to come out and play. A "fishing pole" toy swished around can make a cat jump out to grab it. This both makes him come out and reinforces leaving his hiding spot with behavior he enjoys. If your cat needs extra inducement, you can rub some catnip on the toy or along the ground outside the hiding area. Provide your cat with lots of hiding spots within the areas of your home where you spend the most time. For example cat teepees or cat trees with covered areas can be placed in your living room by your couch, so your cat can hide while still hanging out near you while you watch TV. You can do the same thing in other rooms. You can make feline hiding spots on the cheap using empty cardboard boxes, paper bags or even a pile of blankets placed on the couch that your cat can burrow under. You can even make your own DIY cat teepee. Dealing with hiding behavior is part of owning a cat. You shouldn't try to force your cat to come out of a hiding spot. If you know he's not sick or scared, he may just want some alone time. He will become more resistant to leaving the hiding spot if he feels pressured.